International Women’s Day is a global day, praising women’s achievements in society, culture, economics and politics. Celebrated on the 8th of March, this day is devoted to showing women the love and respect they deserve as well as driving gender parity worldwide. There are still many parts of the world where women suffer gender-discrimination and don’t have access to the same level of education that men receive. Everyone is encouraged to help get involved this year, and we are doing exactly that. 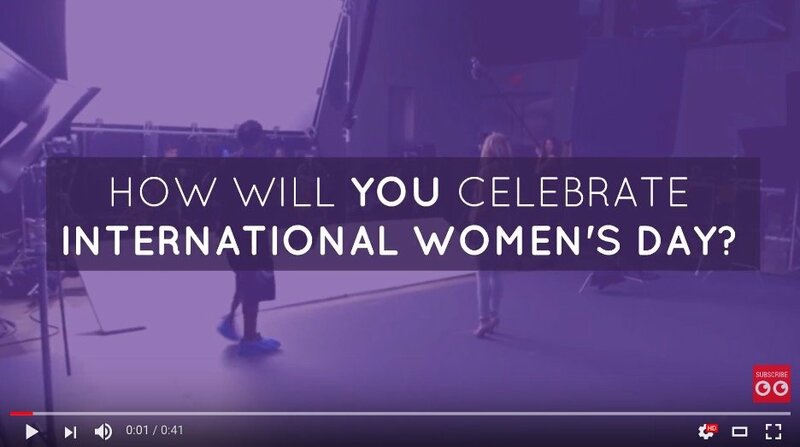 In celebration of International Women’s day 2017, we have put together some of our favorite video marketing campaigns that help praise the achievements of women and inspire us to create a more gender inclusive world. 2016 saw individuals and organizations around the world support the #PledgeForParity campaign, which aimed to help females achieve their ambitions and create a more inclusive flexible culture. This year, the International Women’s Day theme is #BeBoldForChange calling for the everyone and anyone to assist in creating a better working environment and a more gender embracing world amongst women, men, and gender variant people. International Women’s Day is not only a day to celebrate the achievements of women but to declare the bold actions that you are taking to help accelerate gender equality. What better way to do so than with video? Video is one of the most powerful mediums we have to connect with others. The transparency and emotional connection that can be created using video can help you better communicate your message with an audience. Over the years, many brands, organizations and individuals have used video to help share their message in support for International Women’s Days. Challenge stereotypes and gender inequality. Support and champion women’s education. We have scanned the internet, searching for the most powerful marketing videos that have helped highlight what International Women’s Day is all about, with the aim of empowering women around the world. Below you will find five marketing videos, some known and other relatively unknown, which we believe really represent everything International Women’s Day stands for. One of the most difficult situations that brands face when it comes to video marketing is being authentic. Always’ #LikeAGirl marketing campaign is an example of how brands have started to use video marketing in a way to empower women. Always’ campaign is centered around the phrase “Like a girl” which has been used in a derogatory way for so long. Always wanted to change that, thus setting out to create a video marketing campaign that empowers women during a time of their life when confidence is at their lowest. Always’ marketing video was a success. Not only did it make people change how they viewed the phrase “Like a girl” but they achieved more than 85 million views on Youtube from over 150 countries. Before watching the video, just 19% of women aged 16-24 had a positive view towards the phrase “like a girl,” which changed to 76% after watching. How’s that for a positive turnaround. Dove launched their stunning “Real Beauty Sketches” marketing campaign back in 2013. In today’s society, advertising and media have put pressure on the way we judge beauty. Only 4% of women globally consider themselves to be beautiful. Dove wanted to create a campaign that targeted the other 96% and convince them otherwise. Their marketing video revolves around an FBI-trained sketch artists who draws females based on their self-perception and then based on a stranger’s perception. Dove’s Real Beauty Sketches campaign fits in well with the company’s wider message to make beauty a source of confidence, and not a source of anxiety. Another powerful video that celebrates International Women’s Day is Google’s #OneDayIWill marketing campaign. International Women’s Day 2016 saw Google pay tribute to women in a fun and friendly way with their doodles. Google’s women’s day ad beautifully captured the aspiration and dreams of many females from all across the world. To go one step further, in most of the filming locations, Google used female-only crew members to help establish a supporting and celebratory environment. Google didn’t stop there. Their International Women’s Day efforts were extended with the appointment of 7 popular female Youtube personalities to become Change Ambassadors. When it comes to using video as a medium to celebrate International Women’s Day, Google are definitely pioneers! To celebrate International Women’s Day, Brawny launched a special marketing video which saw four compelling women replace their iconic mascot. International Women’s Day is all about recognizing the accomplishment of women and helping to encourage conversation about female initiative and influence. Brawny #StrengthHasNoGender campaign did exactly that. Brawny’s women’s day ad perfectly highlighted how to face life’s challenges with the strength of character. The four females that featured in Brawny’s Women’s day ad worked in some of the toughest areas of work around. Microsoft used International Women’s Day as an opportunity to educate how important a role females have played throughout our society. In the women’s day ad, young girls are asked to name any inventor that comes to mind. Benjamin Franklin, Leonardo Da Vinci, Thomas Edison, Albert Einstein, Nikola Tesla… but what about the women inventors? The video then takes a different approach by highlighting some of the great work women inventors have done. Microsoft’s message was that if society actually wants to see more women working in science, technology, and other fields, they first need to learn about their achievements. We need to celebrate the success of women inventors. The likes of Katharine Blodgett, Stephanie Kwolek and Nancy Johnson, all of whom have played such a vital role in pushing society forward. How are you going to celebrate International Women’s Day 2017? How will you #BeBoldForChange? From throwing your own celebratory event to sharing your support through social media, there’s something that everyone can do this year. Of course, as Moovly is a multimedia platform that specializes in video, we want to encourage more and more people to support this year’s theme through video! You can sign up for free to get started and create your #BeBoldForChange video. Challenge stereotypes, educate others about positive relationships, hail the success of women leaders and celebrate women researchers all through Moovly. Once you are done, make sure you use the hashtag #BeBoldForChange in the title of your Moovly video, so that we can identify your finished Moov, and share it across our social channels in support of International Women’s Day 2017.